If you’re at a standstill wondering if you should go on a ski trip or be practical, stay home, work, and not go on the ski trip, I’m here to tell you that you should most definitely go on the ski trip. Even if you just got back from Mexico City and are leaving three days later for another continent, just go on the ski trip. I was invited to go skiing with a group of friends last month, and I immediately wanted to go, because Mammoth, of course, and what a dream it was to be there last year. As the trip got closer, I started having doubts because 1.) all this travel means I haven’t really been working (ie. earning money) that much, and 2.) I was feeling wildly disorganized by the lack of time between trips. I couldn’t make up my mind about going, but I guessed that it had been made up for me since we’d already purchased lift tickets and booked the Airbnb. Then, sort of miraculously, a * normal * person from Craigslist decided to sublet my room for the month. She came on the last day of February—she was the only one I showed the room to and mine was the only room she looked at, but we were both ready and it seemed like a good fit (and still does). Around the same time, I got an offer for a new freelance writing job to bring in a little side income while I flutter around teaching yoga for two hours a day. Two loads off my shoulders. Whew! So all that could’ve fallen into place did, and the ski trip was happening. We drove the 5 hour trek up to the snowy mountains (not a problem for Suzie’s Suburu Impreza) , checked into the very 80’s ski condo, and sipped some cocktails, because, well, of course. There were four of us in the first car, waiting until later in the night when the rest of the group would arrive. Once the second car made it to the condo area, they got stuck at the bottom of the hill, and we had a bit of an exciting time putting chains on their tires (ie. me holding my phone flashlight while the guys did the work). The first day of skiing was hampered by the biggest blizzard I’ve seen in a while, so many of the lifts were closed. We drank Irish coffees in the lodge and almost called it quits, but as we were about to pack it in, we found an open chair with great conditions and did laps there for the rest of the afternoon. On Sunday, we decided to avoid the crowds and possible windy conditions and opted to check out June Mountain, which is still as much of a gem as the first time I saw it. What a perfect day! Anyway, the moral of this story is to stop all of your non-skiing nonsense, expect everything to fall into place, and go on the ski trip. Hi! I’ve just freshly landed in Australia, but before we get to that, I better tell you about the time in February (too long ago now) when my mom and stepdad came to visit me in LA. It was kind of “cold” for visitors (ie. it was 60 degrees and I had to wear my ski jacket), but they were en route to Cabo, so I didn’t feel too bad. I almost went to Mexico with them, but the hotel they were staying at only had couple’s suites and that would have been a bit too much togetherness for us all. Instead, we had a few days in LA. We were able to do a lot of the sightseeing stuff that I’d not gotten to yet. I showed them the worst of traffic—only once! They tried In-N-Out (overrated) and a few of LA’s other most fine and trendy eateries, like Sqirl, Republique, Manuela, and Donut Friend (not overrated). I’m very into building itineraries, so I packed way too many activities into each day. We sprinted around Huntington Gardens, stopped by the Getty Villa, and ate in the Arts District all in one day, which are all in opposite directions if you didn’t know (hence the traffic). I brought my mom to work (aka yoga and Zumba class in Monterey Park) and was wildly impressed that the Zumba teacher made up a special dance with costumes for Chinese New Year. To be a conscientious teacher like that! We saw the Rose Bowl Stadium, which is kind of just there and you can’t go inside, so maybe strike that one off your list if it’s not football season and you aren’t staying in Pasadena. We had a very Hollywood day when we took a celebrity van tour—so much fun and you must, must do this when you host visitors or are a visitor to the area, if not for the celebrity homes then for the views and for seeing parts of LA that you wouldn’t normally feel like driving to. Then we went to the Pantages Theatre to see Hello, Dolly! where everyone promptly fell asleep because I didn’t calculate our energy levels when planning the ultimate Los Angeles experience. Oh well. Overall, it was an amazing few days and I’m so happy they could make the time to stop here before their beach vacation. I love showing people around as well as finding new fun places for myself, so come visit whenever you can! If your parents, like my dad, ever get tired of visiting you in the city where you live (and to be fair I cannot blame them for LA is a tiring place), a fun thing to do is to meet them in other places and have an adventure for the both of you. My dad attended a weeklong conference in San Diego for work at the end of last month, and, lucky for me, he decided to tack on a few extra days so that we could explore. Last year, we spent my 30th birthday trip together at Mammoth Mountain, but this time we took a sunnier route… or we mostly intended to, but it’s actually been pretty dreary and cold down here in SoCal for the past month— it even snowed?! No matter! We didn’t let the rain or grey skies ruin our plans to go out in the Gaslamp District. I put the cap on sober January when we found a trailer park themed bar, and I lost my favorite ring when I got too enthused about arcade basketball. By day, we rented Bird scooters for dad’s first time and took a pretty long ride (for scooter riders) up the coast to La Jolla. We got up close and personal with sea lions. They’re near enough that you can just about reach out and touch them, if you’re in the business of disturbing nature’s peace, so obviously it was the highlight of the trip, if not my entire life. After we had scootered back down, we took our chances at spotting some whale migrations at the Cabrillo National Monument. Unfortunately, whales were not in the cards for us this trip, but we still saw some pretty nice views of the city. Whale sightings or not, it was an excellent opportunity to spend a weekend out of town and an easy way to get some dad time in. I’m glad we can always find new ways make the most of our time together! I hope you’re finding some joy in these late winter days, too. Whew, y’all. The late January and early February times have brought an abundance of visitors to the SoCal area, and I can’t help but feel thrilled about it. My best friend, Annie, from college had the chance to come out for a few days, and it was the most perfect timing because her sister is living almost down the street from me and we already hang out all the time! I wish we could permanently add Annie to the neighborhood, but we’ll take a weekend if that’s what we can get. It was one of the first opportunities I had to explore LA for visitors and find the fun things to do. We painted pots, strolled the best bookstore, rode swan boats, and celebrated the bulldogs racing in a derby. There was a lot more celebrating than there was actual racing, but what else are sporting events about? One morning, we walked through the Downtown Los Angeles Flower Market, and if you are buying plants, especially succulents, anywhere else, you should really rethink your habits. We showed up towards the end of the morning when a lot of the stalls were already shutting down, but even still, I’ve rarely seen so many beautiful blooms in one place. The most fun and unbelievable part of all was that Annie is about 5 months pregnant, so we got to see her in her maternity state, and by the next time we’re together again, there will be a little one to welcome into the world! It’s so exciting and surreal to delight in a ten-plus year friendship and to watch a loved one enter a new stage of life. Blessings all around! Typically, when I get a burst of energy or inspiration, it’s all encompassing and definitely all or nothing. I think I only have two speeds—at home relaxing and recharging or out doing ALL the things. This new year caught me in the hyperactive way, and I was busy planning out every piece of how I wanted to start the first day of 2019. First, I planned on riding the metro to Pasadena to see the Rose Parade. That would be the thing to do for a newcomer to LA with a Gold Line stop right near her house. Then, there’s a tradition in yoga where practitioners attempt to do 108 sun salutations—called a mala—on New Year’s Day (also usually on the equinoxes). I’ve never done it, but I thought of driving over to Santa Monica to Bhakti Yoga Shala right after the parade to try. Now, maybe you know that Pasadena and Santa Monica are on opposite sides of the city, and to do both of those things before noon on January 1st is, if not crazy, then certainly overly ambitious. Also, NYE festivities had me questioning whether I’d end up doing anything at all. I decided I’d better definitely skip the rushed drive to Santa Monica, and opted for a half mala (54 sun salutations) that would take place in my neighborhood later at night. Fortunately, on New Year’s Day, I woke up at the proper time for the parade and forced my hungover champagne self out of bed to take advantage of that. It was totally worth it! The floats were so amazing, and it was surprisingly very easy to get there and find a spot with a good view. I had been worried, because so many people camp out overnight. But after seeing the event, I think that’s more for the fun of being there than for the necessity of securing a good spot. This float from Big Bear was my favorite. Look at the little bears riding the chairlift! After the parade, since I am a single millennial lady looking to start January off on the right foot, I went on an internet date for coffee. He showed me around Pasadena and it was not a bad way to spend the day, but not the best! I’ll remain undecided on New Year’s Day first dates, but maybe consider keeping the whole first day for you and those you’re already close to. Who knows. Afterwards, I stopped by a friend’s for brunch and then, if I remember correctly, finally made it home to take a nap so I would be ready for the nighttime sun salutes. I loved the way the instructor, Nora, divided the repetitive practice into 4 sections of ~13 different Surya Namaskars (A, B, and C). For the first, we focused on an Intention or Dedication for the year. The second round was devoted to our Relationships, the third to our Creativity or Career, and the last round to the Source/the Universe/our Spirit. It was an interesting way to give meaning to the movement, and I appreciate the instructor infusing the ritual with something fresh. When the class ended, I felt accomplished, like I had really started the year the way I wanted (with a little flexibility for what my schedule would allow), and I was so, so ready for bed. I’m back from visiting the desert with a bunch of Austin amigos and happy to say we all survived tent camping during THE ONLY time it has rained or stormed in this area since I moved here. That was seven months ago! Of course it would happen on a night we were set to see a favorite band (Tame Impala) and sleep beneath pieces of fabric under the stars. My tent is more of a Central Texas or Southern California, warm, dry weather style, and wasn’t really designed for all-weather conditions, so I was impressed that it held up during a whole night of rain with only one tiny leak. We made it back to the campsite/car area and sought shelter in the bathroom structure after the Friday night shows were canceled. Luckily, this all happened early in the festival so by Saturday we were feeling much drier and ready to head back out for 2 more days and nights of music and enjoying a festival on the shores of a gosh darn glorious lake. If you haven’t tried it, you probably should. It’s the middle of September and we’re starting to wake up in the dark. If we were living by the clock of nature, shouldn’t we wait just a little bit until the sun shines through the window and warms us up? I guess we started this whole time thing for farmers and, I know only a little bit about farming, but couldn’t the farmers sleep in a bit, too? I’d be ok with it. But the last days of summer bring one of my favorite childhood memories: going to the fair! The Dutchess County Fair, our local event back home in New York, is hard to beat. Even the Texas State Fair for the entire state of TEXAS paled in comparison. That’s saying something. But we’re in California now, and the LA County Fair came through for me. It’s held in a massive Fairplex with two chairlifts to carry non-walking people from end to end. There were your typical treats including rides, games, farm animals, and fried everything. On top of that, there were palm trees, A ZOO, and the aesthetic hanging bistro lights that millennials like me love. I missed pierogi and 4H milkshakes, but they had chicken in a waffle on a stick, so let’s say I did not starve. Last weekend, we celebrated a friend’s birthday at a new favorite beach of mine, Point Dume. 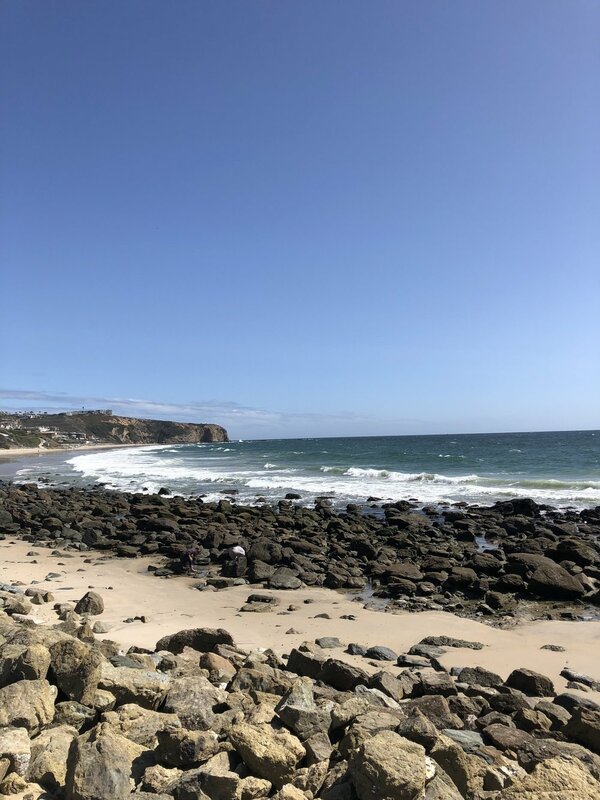 There were rocky cliffs, turquoise waters, sea lions, and the types of things you might think of when you think of Malibu. Actually, I didn’t see the sea lions or think there were sea lions in Malibu, but I heard and believe they were just around the bend. Fortunately, Cricket loves the beach, so she trooped on out to the ocean and the whole group of us had a very nice day. I’m still dreaming of a dog of my own, and I hope you’re still heading outside to seek out sights near you! It was important to me to pick out my campground ahead of time. Even though my site didn’t end up having the best view, I was glad to be close enough to other campers to feel safe without being overcrowded. Solitude can be sweet, but for my own security, I preferred not to be too isolated. I planned to arrive with plenty of daylight to establish camp and scope out the area before dark. Years ago, I also practiced setting up my tent ahead of time just to get the hang of it. I knew I wanted to squeeze some planned activities in—like June Lake Beach and the June Lake Brewing Company—but I also left plenty of time for lounging and breathing. I thought I might get bored in the dark and hit my sleeping bag at 8pm, but my fire kept me interested well into the night, and then I looked up and saw all the stars! Also, you should know how to build a fire on your own. It’s pretty easy in a dry climate. The internet has tips. Luckily, I once went on a camping trip in Austin with a mountain man and two bada** ladies who knew what they were doing, so I acted all “Oh yeah, I know about fires, too,” and observed their tricks while pretending to gather sticks and be helpful. Unfortunately, in the life of a lady (or general person) on her own in the world, sometimes bending the truth is required. I made some friends at the brewery who offered an invitation to come out in Mammoth Village with them later that night. They seemed fun and friendly, but I fibbed and told them I had other plans and hadn’t decided where I’d be staying that night. I might have missed out on some good times, but I had a separate date planned with Nature. I think if someone is going to turn into a real friend, they would understand why you couldn’t be completely honest. That might be all I learned this trip, besides not to eat too many Hot Cheetos on the drive up. If you can get past the initial scariness, camping on your own can be a wildly empowering experience and a great way to enjoy spending time with yourself. Last week, I made a spontaneous pilgrimage to NorCal to visit June Lake, one of the places where I skied with my dad this spring. It's crazy how time slips by--I can't believe I've been out here for almost six months already! After seeing June Mountain in the winter, I knew I needed to check out the area in the warmth of summertime. Even with the five hour drive up there, the day was full and peaceful. I found a musical road in Lancaster, CA on the way, then spent the afternoon hiking around the campground and lounging at the beach. August had made the grounds hot and dry, but the waters of the lake were perfectly cool and refreshing. And I don't think any trip to June would be complete without a stop at the local brewery. I drove around the June Lake Loop whilst eating too many hot Cheetos and scoping out some other more scenic campgrounds. I was pretty happy with the one I chose, but could've used more access to the water (like at nearby Silver Lake in the photo below). Anyway, mine was safe, bear-free, and with bathrooms so I really can't complain. The next day including a brief visit through Yosemite, and I think that deserves a post of its own. I hope you're still out seeking summer adventures wherever in the world you are! I'm happy to tell you that over the past year, basically since going on Echo's yoga retreat in Thailand, I have been able to stick to a daily meditation practice. I've found that it has been immensely helpful in staying connected to my spirit and my intentions and being more mindful throughout the day. Every morning, I wake up and sit for 10-15 minutes as I focus on my breath or a mantra. Sometimes my mind wanders, but lately it's gotten much easier to keep my head clear. I've probably told you before, but one of my favorite meditation tools has been the 21-Day Meditation Experience with Oprah and Deepak. I think it's helpful for anyone who is new to mediation, and I love the balance of Oprah's personal stories and Deepak's spiritual wisdom. Even if it's hard for you to stay focused during the ~12 minute mediation section, there are usually 10 minutes in the beginning where you'll learn something important. This month's theme focused on the Law of Attraction and what it takes to turn our desires into reality. It felt aligned to my own purpose, because this year I've been seeing more and more of my visions come into being. I remember one of Oprah's stories about growing up in poverty, but choosing to spend her time walking around well-off neighborhoods. She dreamed of living in a house with trees in the backyard, and later as an adult she realized that her own backyard matched what she'd once envisioned. 1. Get clear about what you want: This one is hard for me! I wasn't so sure about exactly what I wanted. I only knew more yoga and more ocean time would be nice. I'm not a great example of this, but bring some clarity to your goals. 2. Visualize yourself where you want to be: When we're manifesting, setting goals, or whatever you want to call it, it's important to really believe that it could happen for you. No problem; imagining life as a yoga beach babe is easy for me! I added some extra oomf with pictures on my vision board: the ocean and a bungalow near the beach. 3. Act as if you've already obtained your desires: Get as close to living out your desires as you can. My first months in LA, I spent a ton of time in Santa Monica. Most of the time, it wasn't intentional. I'd just take a yoga class there and spend the evening waiting out traffic. I have a feeling that spending so much time there made it easy to end up back again. 4. Don't give up: Sometimes it can take years for our deepest desires to pan out. Sometimes it takes a lot of shaking up to make space for them. Sometimes they show up differently than we ever expected. In June, I had basically given up hope on subletting a place for the next month-- I resigned myself to the ~3 hours of driving back and forth from yoga training. Then I decided to check Craigslist "one last time" and found exactly what I was looking for. Even if you don't believe in magical manifestations or think the law of attraction is a whole bunch of nonsense, it can be exciting and empowering to set goals (small or large!) for yourself and work your way there. Hope your life is growing closer and closer to all that you've dreamed! *If you're feeling the call towards a Thai yoga retreat this year, Echo & Cole are going back so check it out! The weekend took me back to Joshua Tree National Park where I camped with a new friend and got to see one of my favorite bands in funky little Pioneertown. I have a picture of Georgia, the drummer, on my 2018 vision board and, while I will say that my intention was to play the drums like her, I will accept the universe's offering of getting to see her play the drums in person. I can tell you that Pappy & Harriet's is a magical venue that is well-worth checking out, and if you happen to be doing so, why not stay at the Black Rock Canyon Campground in Joshua Tree? It just might be the thing for you. Once regret that I will never leave behind (mostly because my dad and uncle will never let me live it down), is that when I was some-age-around-middle-school, my sister and I had the chance to visit Australia and we didn't want to go. I remember being at a party or a picnic where we met some of my dad's IBM colleagues who were living in Australia, and they invited us to come for a visit. Just like a few years earlier when I'd cried about being stuck visiting my uncle in Bermuda and missing the first day of our 5th grade sleep-away field trip, I was not having it. I didn't want to miss school or any chance to be cool around my cool friends, and so I was not about to hop on a 24-hour plane ride to hang out with kangaroos and my dad's work associates. No thank you. I am proud to say that my priorities have changed drastically since then. My dad's work associates have given me numerous tips on what to do while traveling the world, and they've taken us skiing or joined us on other adventures. Since I'm a nepotistic girl living in a nepotistic world, I was eventually able to make some global IBM colleagues of my own and visit them in cool places, too. April took me to Laguna Beach to visit my friend Steph, who I met while working in Austin and who was wonderfully hospitable to welcome me into her beautiful beach life. We enjoyed some much needed seaside walking and happy hour time as I got to explore another part of this new state. I'm glad I've become much more of a travel "Yes" woman, and I'm grateful for kind coworkers and friendly faces everywhere that have a way of making the whole world feel like home. Did you know I didn't like it here in LA the first time I came? I didn't like it even one bit. That first visit was about 5 years ago, my sister and I were driving around at the end of our full California road trip, and we had no idea where to go. We took the metro to Hollywood with a lot of smelly people. We found Hollywood to be disappointing (or at least I did, but my sister might have been satisfied with seeing the sign and Ellen DeGeneres' star). We spent a day and a half here and the flight home couldn't come soon enough, although we did stay in an adorable Airbnb which provided our safe haven. I certainly didn't think that one day I would wind up living here. Things in the city have changed since our Airbnb hostess told us to only turn left at the end of our street, never right, if we wanted to preserve our safety. I found out that it's full of interesting things to see and do, beyond the star walk and Santa Monica Pier. And there are still plenty of unsettling strangers to yell at you on the sidewalk. The biggest surprise for me about LA has been the availability of nature and outdoor explorations. I didn't know it during my first visit, or my second or third, but there are a great many hikes to be had around here. While it appears so concrete and traffic ridden to an outsider, the mountains and parks are very accessible once you live here. I've been squeezing in as many hikes as possible during my free hours. It's hard to get myself on the stairclimber at the gym when I know there are such beautiful hills nearby. I'm envisioning myself becoming part of the group of early rising elitists that does a morning hike before the start of the workday, or (more preferably) one that at least breaks up the commute with a climb on the way home. Big news! In the past week, I have found that the best things in life are.... NOT free! They are $46.00 and they are tickets to the annual Pups at the Park night at Dodgers Stadium. Are all baseball teams doing this? I hope so! If not, why not? My friend Katherine filled me in just in time. First of all, Dodgers Stadium is a nice place for a ballgame. You can see California palm trees all along the walk in, and sunsets from your seat. Second of all, dogs. A lot of them. They're out in public; they're all in one place along the right field fence; and many of them are wearing pet-fitted sports uniforms. Third of all, there are unlimited hot dogs, nachos, popcorn, and peanuts, but you should probably always impose your own limits on these types of food items. I imagine the freebies are due to the potential hassles of wrangling dogs, wallets, and trays of baseball treats, but I didn't ask any questions. The girls were a little tired by the 9th inning, not to mention unimpressed with the disappointing 1-9 loss, but I think it's safe to say we got what we came for. Last weekend was about as good as it gets up in Mammoth Lakes, CA. On Thursday, my dad picked me up and we drove to Mammoth for a ski weekend and my early 30th birthday celebration. What a dad! He left home in NY at 5am, drove down to NYC, flew across the country, then scooped me up in a rental SUV with 4WD to take us 5 hours to Northern California. We weren’t sure if we’d need the 4WD, but were glad to have it as we drove into Mammoth in a snowstorm. I probably should’ve driven the California leg of the trip, but my dad is very strict about rules and my name wasn’t registered with the rental company. Who knows what could have happened. So I just stared out the window as we went from rain to sun and back again. 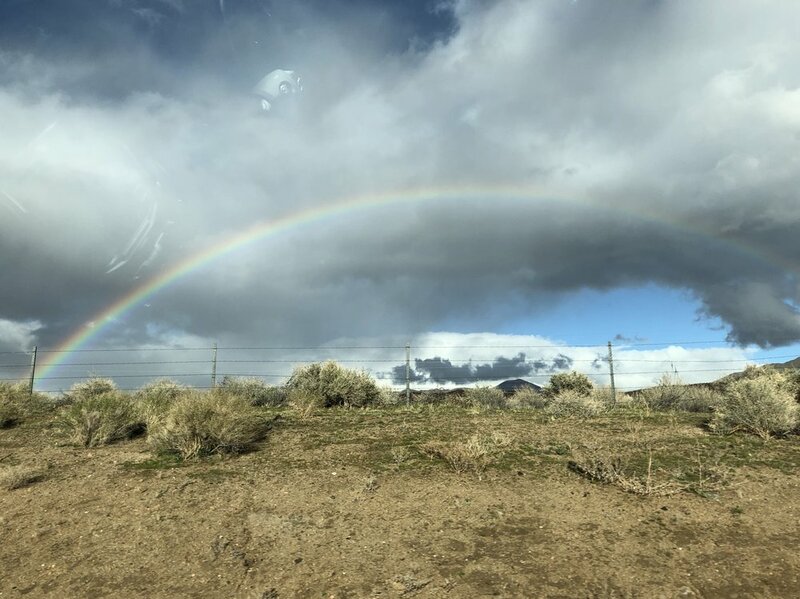 I saw a bunch of rainbows, Joshua trees, and interesting rock formations. We skied an amazing day at Mammoth Mountain on Friday, and another at the well kept secret June Mountain on Saturday. Sunday had us back at Mammoth in a morning blizzard, but it all cleared up by lunchtime to return us to these beautiful views. My head has been pretty clear, and I realize how lucky I am to be on this life vacation where I don’t really have anything to worry about back at “home”. It feels strange calling it home since I’ve only lived there for two weeks, but I'm definitely enjoying the transition. I can't think of a better way to explore my new state and celebrate the onset of a new decade of life! Last week I had an emotional day. Maybe it was all the rain, or that I was PMS-ing since I wanted to eat every chocolate bar within arm’s reach all week. I went to aerial yoga in the morning where we did a lot of deep stretching, so maybe I released something in a chakra somewhere. Everything started out fine. I left yoga class and thought I should visit the DMV since I had the time. My umbrella and folder of materials were already in the car, so I went. There was a free parking spot and the line *only* took an hour. I had all the right stuff to get my license, and the employee told me there were 5 minutes left to take the written test, so did I want to take it or come back another day? A test? I’ll come back next week when I register my car. No, no. I’d better do it now. I tried to keep a positive outlook, but I was feeling anxious because I’m not very expert in official road safety and I was in the last group rushing in before the testing area closed. Well, I failed. I don’t remember which questions I got wrong because, apparently, there were a lot. And now I would have to return someday to bring my smog certificate and retake the test. You can take it up to three times. My cheeks burned with shame as I tried to log back in and retake it before anyone noticed I’d failed, but the screen wouldn’t load fast enough, and I heard a guard approach. “Ma’am, did you fail the test?” Yeah. “You have to come back another day. You can’t retake it right now.” Ok.
My eyes were starting to water. I was a failure! I’d had a feeling I would fail because common sense tests always tend to make me doubt my instincts and think everything is a trick question. But, yup, I failed. I was trying to gather my belongings and get out of there to my car where I could contemplate all of my failures alone in solitude, when this much older man whom I had talked to in the waiting area earlier stopped me to ask for my name and if we could exchange phone numbers. He’s been in LA for 6 months and is looking for a friend. I don’t know what commonalities our friendship would be based on, other than both having waited at the DMV for an hour, so I said “No, thank you” and tried not to feel bad. I thought back to the time in Nicaragua when I gave a guy my number out of discomfort and guilt, and he sent me 100 unanswered Whatsapp messages in two days before I blocked him. I got to my car to cry about not knowing the rules of the road and thought maybe I should have taken his number in case I fail again and need someone to drive me places.